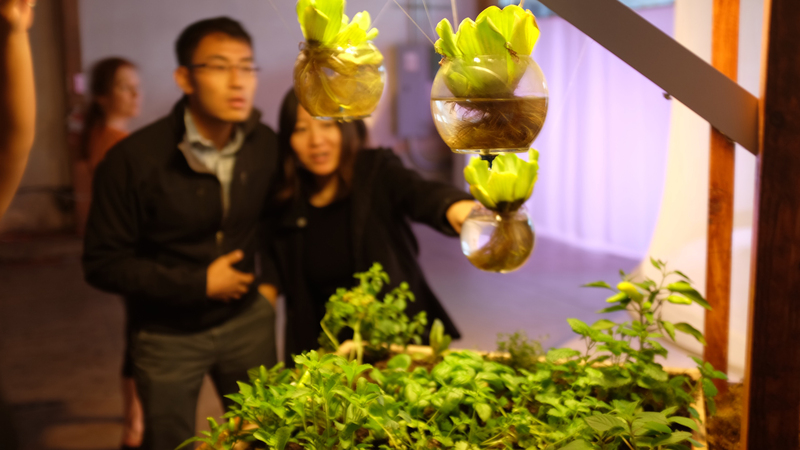 OpenLab: BioSensing Garden is a sculptural garden and water-droplet fountain that visualizes data from a Fitbit, (an exercise tracking device). The fountain is made from a re-purposed printer that drips water onto a pane of tilted glass. The droplets are timed and placed precisely so that they create visualize the data from the fitbit as they fall. Imagery will be projected onto the droplet patterns as they fall onto a garden below. The data droplets are the sole source of water for the plants and so their health is a direct reflection of the amount of exercise from the participant. The project was developed with UCSC students Joel Horne, Sean McGowen, Ian Ayyad, Richard Vallejos, and Professors Jennifer Parker and Engineer Professor Mircea Teodorescu.